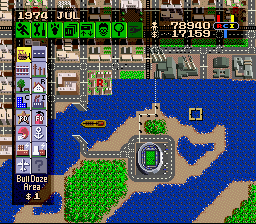 Play SimCity online with Super Nintendo browser emulation for free! 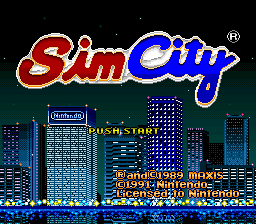 SimCity (SNES) game rom is loaded with features in our flash, java and rgr plugin emulators. Nothing to configure, we've done it for you! Players Vote Unanimously to Bring You Back as Mayor! With much demand, the greatest simulation game for the Super NES is back! Players just can't get enough of the fantastic feeling that governing a unique city provides. Begin with an empty land, start a town, name it yourself and build it into a city. 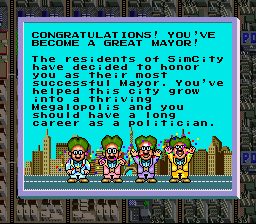 See if you can sustain enough growth to build your city into a megalopolis! Or take on the responsibility of saving a city burdened with problems. Whether it's taxes, zoning, crime, transportation, fire control, pollution, or other critical issues, the duties as Mayor are yours. Time is passing and every decision you make has future consequences. Your assistant, Dr. Wright can help you make the right decisions if you ask. You also have full access to reports, charts and maps that will guide you through the decision making process. 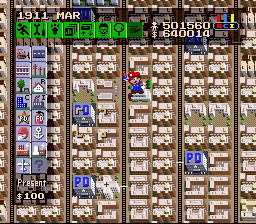 Surprise catastrophes threaten your growing city--fire, earthquakes, airplane crashes, even a giant Koopa who has a nose for industrial pollution! Will your city grow and prosper? Or will disgruntled citizens vote you out of office? You build a city, and they will come - or leave, if you call in Bowser to destroy the town! Simcity is a lot of fun. Its an early sandbox game. The game lets you pick a map, and you build however you want. The game has a mentor named Dr. Wright, who will try to guide you towards building the biggest, happiest city you can make. And while thats fine and good, you don't have to listen to him. You can make a bad city, full of crime and pollution. A city with NO fire departments, or a city that has no highways, only railroads. ?Its open to you from the beginning, you can build however you want, whenever you want, as long as you have the capital to buy it. However, there is not much in haphazard building. You will need a power plant, first. and consider that. Then you must start plotting your land. This game wants grids, not just power grids, it also wants from the 3 types of districts, Industrial (jobs), Commercial (jobs and relaxation), and Residential (population). Building these according to needs is paramount to city growth, as is supply power to each, and roads to run to them - else they move out quickly with no connection to the rest of the town.? If you enjoyed the game Populous, this is somewhat like that. 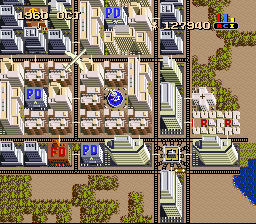 Just be warned this game is about admiring your buildings, looking for trouble spots, and reading a lot of graphs. You are a mayor, but beyond city control and allocations of funds and taxes, your involvement stops there. You direct what people do, but not how fast the groups do their jobs. You are not going with the fire department to put out a fire, but you can build more fire departments nearby to hasten them. 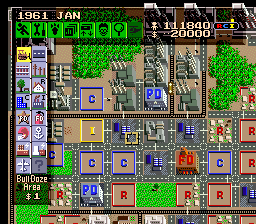 The game takes place with a bird-eye view over your city. Because of the distance, there is no way to zoom in for detail. But you get some touches: the waves lap at the shores, you can see ant-like traffic jams, your planes patrolling the skies, the crowd at a football stadium, etc. You can watch the areas grow, each zone changes form based on the success of the city.l The highlight being the bright graphics of some of the awards you get from your mentor, and the merging of two successful buildings into one big one. But the graphics are not this games strong point.? The music is different depending on the level of your town (village to town, town to city, etc). All of it is fairly nice, but there is no going back to select previous ones. The industrial grind of metropolis is not as peaceful as the village music, but it fits the size of your towns. Sound effects are sparse, the click of menus, a siren when something bad happens. A dull thud of a building exploding from an earthquake, or other natural disaster. You can make Bowser stop by your town if you're feeling bad, and he roars occasionally. Simcity is very fun. 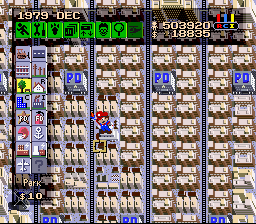 From having free reign to build, and the difficulties of juggling managing a bustling city, there is a lot to do here. As you build things and perform well, Dr. Wright the helper will offer you rewards. Its great fun in the main game, but perhaps you prefer some structure. ?There are also scenario games, such as rebuilding after a disaster, which give you cities already, and let you deal with their problems. If it was just up to you taking scenarios, or freeplay growing your town, I'd give this game a 2. But with the introduction of Dr. Wright, you at least get a small feel for having planning strategies, and the many forms and graphs help everything seem more official. Its not much of a story, but it also doesn't get in the way of what you want to do - and thats a good advantage. But also, you don't quite feel like a mayor, and more like a dictator. You never leave office, you don't have any committee meetings, its streamlined for ease of playing --but no one says no to you - and that feels a little weird. The people of your city are often complainers. There is always something they're mad about, and popularity is a big responsibility in this game. Learning how to grow your town efficiently, balancing their needs with the requirements of expanding takes some patience and planning. Its not just responsibility, you also get to have a lot of fun. Your gifts add variety to the landscape, and there is many things to get. The game just has a curve to master it, and managing your money. Most of the times the natural disasters are yours to choose to implement, and do not affect the main game. I would have liked to see situations like you facing getting voted out of office, or perhaps using your police department to prepare for say a crime spree.? SimCity is great fun to build, fairly easy to understand, and takes awhile to master. With your ability to name the region, enjoy living in ZOMBIETOWN, or perhaps you'll call it EVERYBODY RUN!! or even NEOTOKYO. ?The Biggest hangup is at the beginning, where you are drawing maps to select, and the load time is horrible (like 10 seconds a map, and there are over 900 to look at). I'll just save you the trouble and tell you 061 is a great map. Try that. 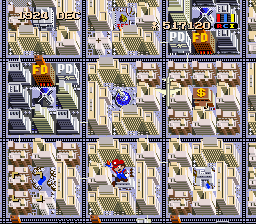 At any time while playing a city, spend all of your money. When the tax screan apears at the end of December hold down L. Select Go With Figures and then go back to the tax screan. Turn all of the dues to 100% and exit still holding L. When you release L your money will be at $999,999. On the See you soon! screen, on controller 2, type: left, A, right, Y, up, B, down, X, select, start, start, select, R, R, L, L. The debug mode menu will appear, with several options, including "MEMORY". "MEMORY" must be set to "SET" if you want to use the other 4 or 5 cheats in-game. You can always replace the roads with rail tracks the game accept such arrangement. And you would eliminate traffic congestion for good. Plus your zones grow to the highest density possible provided the demand is there. I like the bonus/achievement bulidings. Gives the game more depth and excitment and extra cash. I can't do that money cheat, am I suppose to spend my money a certain way, or release L sooner or later? Railroads have to touch at least 1 rail on IND and COM zones and dont have to have a destination to anywhere. RES zones are more complicated.. They have to touch at least 2 rails I think and must have a valid destination..
how do railroads work on this game? Finally reached 500,220 citizens wasnt easy for me. which is the best map to use?? how do i do the cheat with the standard computer controls?? I can't reach 500,000 citizens. I'm stuck to 486,000!!! !